This is a wonderful magazine, quite serious in tone, and very informative. The benefits and profitability of organic farming are well discussed, as are the principles of being organic in a small personal garden. I have only bought this magazine when I've been in Australia, and I haven't checked its full availability out. 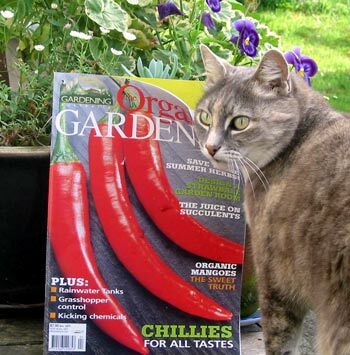 I've found it a particularly good read, and definitely pertinent to organic gardening in New Zealand. I enjoy the features on the vegetables, though it embarrasses me when I think of the state of my own patch. I try to grow organic vegetables - it doesn't make any sense to spray the things we eat. Even the advertisements in this magazine are really interesting to read - that surely says something! As with many Australian magazines, it is fairly climate specific, as Australian gardeners live in such diverse climatic regions. Readers from further afield will find it easy to identify their own gardening zone. And after reading about typical Australian pests, gardeners may look more fondly on those in their own backyards!